CHICAGO (WLS) -- A generous gift will be given this week to an elderly Chicago man who has gained worldwide recognition for his work ethic and unwavering dedication to his family. 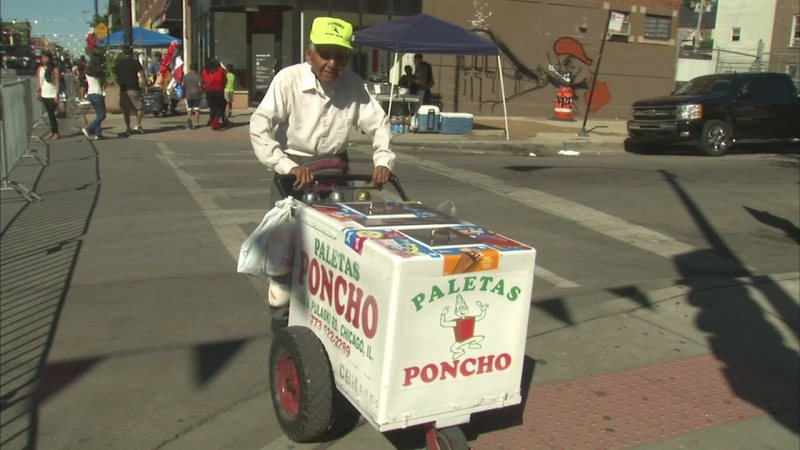 Fidencio Sanchez, an 89-year old paleta vendor, has been selling popsicles in the city's Little Village neighborhood for more than 20 years. Sanchez had intended to retire. But when his daughter suddenly died a few weeks ago, he and his wife became the sole supporters of their two grandsons. So they went back to work. "We thought, 'What are we going to do? We have to pay the bills,'" Sanchez said. A man who saw Sanchez pushing his cart through the neighborhood started a GoFundMe campaign to help him pay his bills. The original goal was $3,000. As of Monday afternoon, more than 17,000 donors had raised more than $382,000. Sanchez said he and his wife were a bit overwhelmed by all the generous people in Chicago and around the world. The campaign ends at 4:30 p.m. Monday. To make a donation, CLICK HERE. Sanchez will be presented with a check Wednesday at a special ceremony.